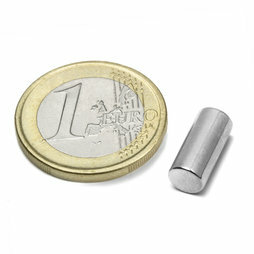 An extra strong, small rod magnet. It is wonderfully suitable for securing paper on a magnetic board, a magnetic glass board or on our self-adhesive metal tape in a safe and elegant manner. On a magnetic board it can hold approx. 10-12 sheets of A4 paper, on a glass board thinner notes and on our metal band approx. 8-10 sheets of A4 paper.